At St Thomas Becket School, we aim to deliver a high-quality computing education that will equip pupils to use computational thinking and creativity to understand and change the world. We want our children to become confident, competent and creative users of technologies. We follow the 2014 National Curriculum Programme of Study from which we have developed our own scheme of work. At the core of the computing curriculum is Computer Science in which pupils are taught the principles of information and computation, how digital systems work and how to put this knowledge to use through programming. 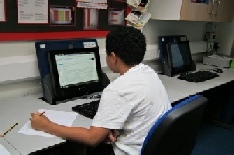 The aspects of computational thinking are taught throughout the curriculum and can be applied to problem solving in mathematics, science and design technology. The children are taught how to create programs and a range of content to express their understanding and to enhance the learning of others. The children also learn how to be digitally literate, to communicate and collaborate effectively using web tools and to search and interrogate information. Each year group also study a significant individual who has made an impact in the development of computing. At the heart of our curriculum is the importance of online safety. At our school, we deliver a rigorous online safety programme from Reception to Year 6 which is supported through our involvement in national events such as Safer Internet Day. Computing is embedded in teaching and learning across the school and supports our home-school partnerships through the MLE and LGfL programmes which are accessible anywhere. We aim to give the pupils a voice in the use of technology through our digital leaders programme and our Head Boy and Head Girl blog. We strive to enable our pupils to be independent learners through the use of mobile technologies and to prepare them for their role in a digital world.